The natural gas leak at Aliso Canyon earlier this year was already one of the worst environmental disasters in US history. Several months later, however, it has now gained the additional distinction of being the first industrial methane point-source visible from outer space. On the one hand, this is yet another illustration of the tremendous magnitude of the leak, which coughed up roughly 97,000 tonnes of methane, equivalent to the average annual greenhouse emissions of more than half a million cars. But more broadly, it speaks to the growing role of satellite technology in monitoring the environmental footprint of the oil and gas industry. Just last month, the Obama administration announced the first-ever methane emissions regulations for oil and gas companies which will mean stricter oversight and tougher standards for new and modified wells. (Unfortunately, the rules do not yet apply to existing oil and gas wells, limiting their overall impact on the industry.) It’s a small but important step toward starting to reign in methane, a greenhouse gas with 80 times the global warming potential of CO2 that makes an under-appreciated contribution to climate change. 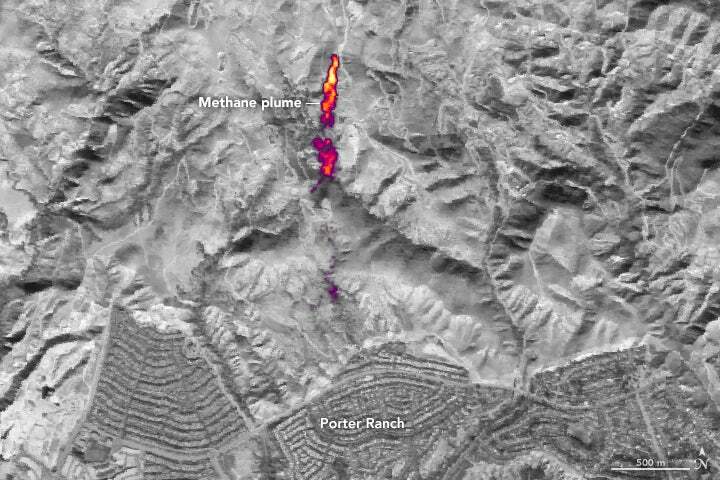 As a highly visible methane disaster, the Aliso Canyon gas leak has helped mobilise public support for tougher methane regulations.